A nutrient dense, ultimate superfood pregnancy smoothie with organic berries, greens, flax hemp meal and almond milk. Perfect for the first trimester when you’re nauseous and can’t keep anything down, for the second and third trimester when you feel like you’re starving and want a healthy meal, and for postpartum when breastfeeding. Look at me all 6 months pregnant! And drinking my ultimate superfood pregnancy smoothie. You guys, I drink this smoothie every. single. day. I never fully understood the meaning of “hangry” until I was in my 2nd trimester of pregnancy. My first trimester I had barely any appetite at all. Eating was a chore. Which was crazy because, hello, I love food. Most days I would just eat cereal, crackers, and this smoothie. But around 16 or 17 weeks, I would go from not hungry to STARVING in a matter of minutes. Lots of snacking on granola bars and apples with peanut butter. Or sometimes, potato chips. Shhh. Don’t tell anybody. 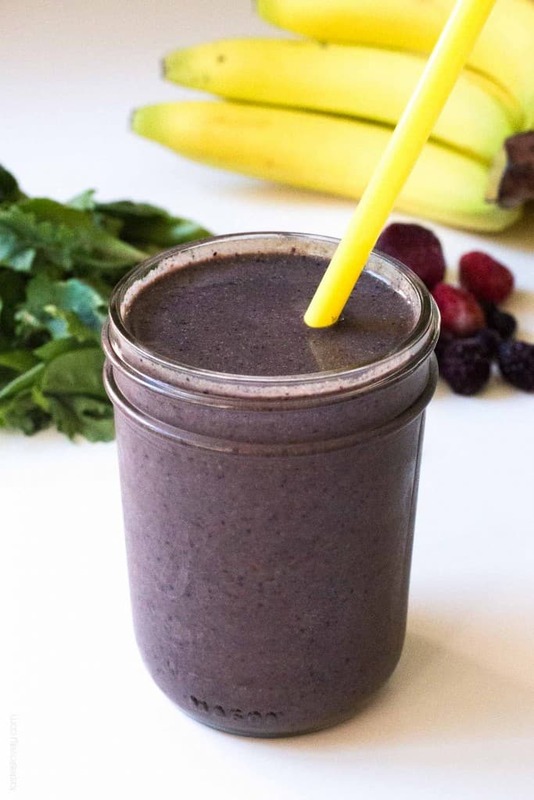 This superfood pregnancy smoothie has been such a saving grace for me. I have it everyday for lunch around 11am, and since it is so nutrient dense I don’t get hangry anymore. Well, until 10 minutes before dinner time, when I need to eat. NOW! I have never been more conscious of what I am eating than I am right now when I am pregnant. All the fruits and vegetables I buy are organic, along with almost all my other food. I’ve also gotten really particular about the meat I buy. All hormone free and organic. It costs a little more, but I want to make sure me and baby boy are getting the highest quality food available. Organic Frozen Berries: I buy a bag of organic blueberries, blackberries and strawberries at Costco. Berries are packed with antioxidants, boost heart health and lower blood pressure. Organic Banana: I use 1 fresh banana, but you could definitely chop it up and freeze it too. Bananas have tons of vitamins and minerals, especially potassium which helps build muscle and synthesize protein. Organic Flax Hemp Blend: I buy this big bag of Carrington Farms Organic Flax Hemp Blend at Costco. Flax seeds have omega 3, fiber, antioxidants, and hormone balancing phytoestrogens called lignans. Hemp seeds are THE most nutritious seed in the world. One of the only plant based foods considered a complete protein, providing the perfect balance of Omega 3 and 6 essential fatty acids to promote heart health, lower triglycerides, and help reduce inflammation. Hemps Seeds contain all 8 amino acids that your body is unable to generate on its own, in addition to vitamins, minerals, and fiber. Best part is hemp seeds curb hunger, so you won’t get “hangry”! When they’re blended up, you don’t even taste them. Organic Greens: I get this Deep Greens Blend of organic baby kale, chard and spinach. It is triple washed, so I can just throw it straight into my smoothie. These dark leafy greens are important for skin and hair, bone health, and provide protein, iron, vitamins and minerals. Don’t worry, you don’t even taste them in the smoothie. Organic Virgin Coconut Oil: Coconut oil is a great source of healthy fats. It aids in digestion, is great for your skin and hair, and builds your immunity. Plus, it gives a nice tropical sweetness to the smoothie. Unsweetened Vanilla Almond Milk: This is my preferred dairy substitute. Almond milk has 50% more calcium than milk, is cholesterol free, and it is super low in calories. Having just 1 of these pregnancy smoothies a day really puts my mind at ease knowing me and baby boy are getting a ton of nutrition. And I don’t feel guilty when I have dessert every night after dinner. Usually ice-cream, and at least 2 scoops. Hey, we need our sweets too! 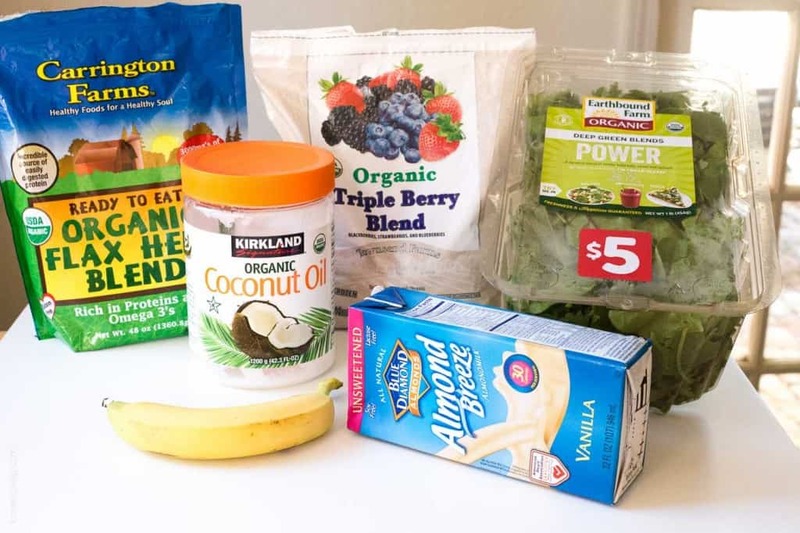 Combine all ingredients in a blender and blend for 45 seconds. Enjoy! None of this was sponsored, this is just the ingredients I love! I love everything about this. You look amazing! I ‘heart’ this nutritious smoothie. Smoothies are one of the most healthy breakfasts on my rotation. You look awesome! This looks like such a great feel good smoothie recipe. I have been getting back into making green smoothies lately and I am always looking for new recipes, so I will definitely have to try this one! You are totally the cutest preggo person ever. ;) Glad you found a great way to get all your nutrients in!! Sounds yummy, too! You look wonderful Natalie! I love how nutrient packed this smoothie is. I’ve got to check my Costco for that hemp blend – sounds like it will be a great addition to smoothies. Can’t wait to try this one! You look gorgeous, Natalie! :) Love this nutritious smoothie! Such a healthy and delicious way to start the day! I haven’t made a smoothie in forever. You look great! You are just beautiful! I never had been a huge smoothie drinker, but lately I’ve been digging them for all of the different varieties you can make and how many nutrients you can pack in there. This one looks perfect! Awww! Your bump is totally the cutest, Nat! And this smoothie seriously is speaking my name right now! I can never say know to a power-loaded superfood smoothie! Gotta give this one a try asap! This is so awesome! You are such an adorable pregnant lady :). I can’t believe it’s been 6 months!! I will have to send this recipe to my preggers friend :). You are looking amazing!! I love smoothies for a quick and easy meal or snack in between my little guy’s naps- I’ve been adding a little bit of brewers yeast, along with flaxseed, to mine for lactation benefits. Definitely going to give this one a try! Time is flying by…6 months already! You look great, and I love that photo so much. :) This smoothie sounds awesome and I wish I had it when I was pregnant! During my pregnancy I would drink a smoothie just like this! I absolutely loved it! AND your little baby belly is SO cute!! So excited for you friend! I’m looking desperately for something that I can eat throughout the day while I’m pregnant. I’m pretty much constantly hungry and tend to throw up if my stomach gets the tiniest bit empty. So I’ve been eating non stop and it’s not always the best choices even though I am trying (the pounds I’m packing on aren’t awesome either). Is this something I could eat multiple times of day and be alright? Like, breakfast, snack, lunch, whatever? Hi Shawna! Oh, I remember that. 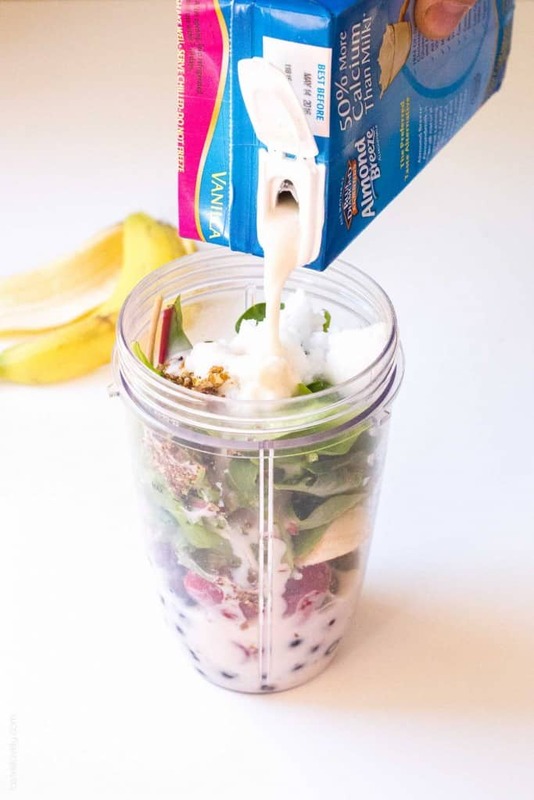 This would definitely be the perfect smoothie to eat throughout the day! Healthy and packed with nutrition. And should be gentle on your stomach. I snacked a ton on apples and peanut butter, and KIND granola bars. Wishing you all the best thru the rest of your pregnancy! What would a good substitute for the coconut oil be? You could just leave it out if you don’t like it! Where do you get the greens blend? We have been ttc for months now. I am very excited to try this smoothie! You look absolutely beautiful! I got mine at Safeway! But you could really use any greens you have: spinach, kale, etc. I do a similar recipe but good idea to use coconut oil. This made at least two smoothies, but I was shocked how delicious it was, thanks for the recipe! I will definetly make this every morning. I’m so glad you liked it! Congrats on your pregnancy!